I’m going to warn you right up front. This post is being written on the Saturday evening of Labor Day weekend. I’ve had a tough day (don’t ask). I’m writing about a topic that no one is going to care about, but is in fact very important. Let’s start: The Bureau of Economic Analysis publishes quarterly statistics on “corporate profits” and “corporate profits of domestic industries.” Corporate profits of domestic industries are used to calculate Gross Domestic Income, which is should be equal to Gross Domestic Product. (To see a little discussion of GDI, see this James Hamilton article and here). Here’s the question: Suppose a U.S. company discovers that the cost of importing a good or service is less than the cost of buying it from a domestic producer (or making the good or service itself). The executives of the company decide to boost profits by offshoring production of that good or service. Should that increase in profits be treated as an increase in “corporate profits of domestic industries”? And by extension, should that count as an increase in GDI? And by extension, GDP? Today the Federal Reserve announced that manufacturing output rose 1.1% in July, led by an 9.9% gain in the output of motor vehicles and parts. Over the past year, the output of motor vehicles and parts rose by 32.6%. But remember, this is an output gain, not a value-added gain. Output measures the number of motor vehicles and parts leaving domestic factories. But it doesn’t take into account any increase in offshoring–that is, use of imported parts. It turns out that over the past year, imports of motor vehicle “parts, engines, bodies and chassis” rose by 79%. Yowza. The implication is that there are a lot more imported parts and engines going into ‘American-built ‘ cars and trucks. So value-added in the domestic auto industry–which is what really matters–went up less, maybe a lot less, than 32.6%. Everyone is familiar with this chart–total imports as a share of GDP. (In fact, I can’t count the number of times I ran this chart, or something similar, in the pages of BusinessWeek). The chart appears to show that the import share of the economy in 2009 was basically the same as it was in 1999 (13.7% vs 13.4%). 1) Purchaser versus producer values: GDP values a shirt in the store; the import figures value that same shirt when it enters the country, not including the cost of getting it to the store and selling it. That difference between the store ( ‘purchaser’ ) value and import (‘producer’) value can be enormous, depending on the particular item. In the case of men’s clothes, for example, the BEA’s data shows that the store value of men and boys apparel is almost triple that of the producer value, with the bulk of that difference coming in the margin of retailers. More typically, the cost of goods to the final purchaser is roughly about double the producer value. Adjusting for domestic transportation, wholesale and retail margins gives us a higher share of imports in the economy. 2) Final vs intermediate : GDP values a car when it is bought by you, the ‘final purchaser’, in the showroom. It does not count separately all the ‘intermediate’ goods and services that go into that car. 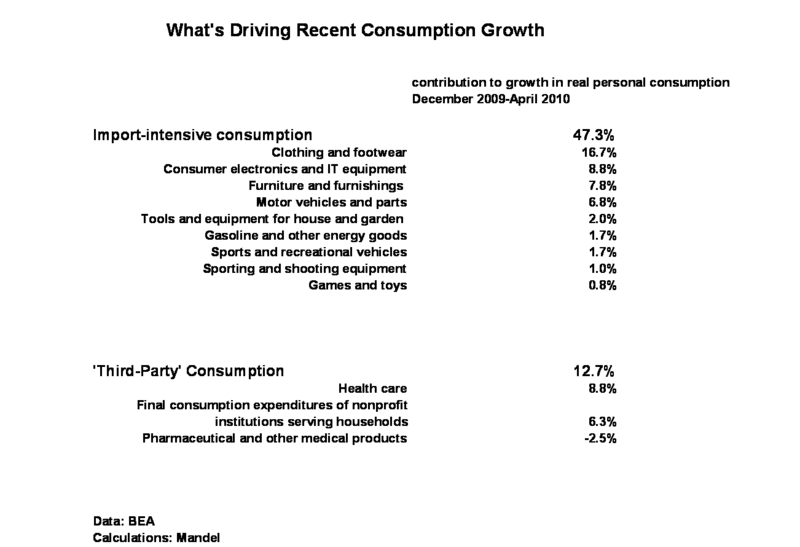 So the value of the car radio, say, does not show up separately in GDP, even if it is made by a different company. By contrast, imports include both final goods and services (sold to the ultimate purchaser) and intermediate goods and services (used by businesses, nonprofits, and government to produce final goods and services). So ideally we would divide imports by a measure of U.S. economic activity that includes both final and intermediate goods and services. That’s not an easy concept, but the closest that we have is the “gross output” measure constructed by the BEA as part of its industry accounts, which counts purchased intermediates as well as final goods and services. In 2008, gross output was $26.6 trillion, roughly double the $14.4 trillion in GDP. Adding in the production of intermediates gives us a lower share for imports, though it has an ambiguous impact on the time trend. 3) The import-domestic price differential: In many cases, the producer price of importing an item from China or another country is substantially less than the price of the same or similar item produced domestically. It has to be–that’s what drives the whole offshoring movement. No one would source from overseas unless it was cheaper. However, when we divide the dollar value imports by the dollar value of GDP (as in the chart) and use that as a measure of import penetration, we are implicitly assuming that the price of imports is the same as the price of the comparable domestic goods. Let me give you an example. In 2007, Americans bought about $100 billion in furniture (valued at producer prices). We imported about $30 billion in furniture. How much has imported furniture penetrated the American market? If we divide $30 billion into $100 billion (30%), we are assuming that $1000 buys the same physical amount of furniture, whether it is spent on imported or domestic furniture. But what if imported furniture is roughly one-third cheaper (producer prices) than the comparable piece of domestic furniture? Then $1000 actually buys much more imported furniture (perhaps a table plus chairs) than the same $1000 spent on domestic furniture. Then the ‘real’ import penetration–measured in physical pieces of furniture–might be closer to 40% or 45%. Adjusting for the import-domestic price differential would tend to raise the measured share of imports. Unfortunately, there is no statistical agency that collects data on the import-domestic price differential. None. The BLS does an underfunded job of collecting data on changes in import prices, but there is as yet absolutely no official data on the import-domestic price differential (see here for an outline of how the BLS might do it). However, anecdotal evidence suggests that the import-domestic price differential for goods from China is on the order of one-third. That is, the price of goods sourced from China is roughly two-thirds of the same goods sourced domestically. (see, for example, BusinessWeek’s 2004 story “The China Price”). New research by Susan Houseman of the Upjohn Institute and Christopher Kurz, Paul Lengermann, and Benjamin Mandel of the Fed finds “systematic import price differentials between products from advanced versus developing and intermediate countries,” which suggests ranges for the import-domestic price differential for the U.S. Using one-third as a starting point for the China-U.S. import-domestic price differential gives us a chance to calculate China’s ‘real’ share of the U.S. market for manufactured goods. This chart shows China’s goods imports, as a share of U.S. domestic market for non-oil manufactured goods, under the assumption that goods imported from China are one-third cheaper than the comparable goods manufactured in the U.S. The denominator is the gross output of non-oil manufacturing at producer prices (from the BEA’s industry accounts) minus exports plus the adjusted value of imports. Imports are adjusted under the assumption that non-oil imports from developing countries are one-third cheaper than comparable U.S. products, and non-oil imports from intermediate countries are one-quarter cheaper. Using this procedure, I estimate that the ‘real’ import penetration of Chinese-made goods was roughly 9.7% of non-oil manufacturing in 2008, up from 2.9% in 1999. China also has a much bigger real import penetration than other major import partners of the U.S. Japan, Germany, and Canada are advanced countries, and we would expect a relatively small import price differential. Mexico is somewhere in the middle–a smaller price differential than China, but bigger than industrialized countries. So assuming a 33% import-domestic price differential for China and a 25% import-domestic price differential for Mexico gives us the following chart. China’s penetration into the U.S. manufacturing market is more than twice as big as Mexico and Canada (omitting oil). That explains why China has become so much the focus of political debate, rather than Canada and Mexico, or Japan and Germany. IMPORTANT CAVEAT: These are preliminary calculations. Have fun, shoot holes in them, tell me that I’m an idiot. But in exchange, I reserve the right to change them and put out new calculations without an ounce of apology. My view is that we suffer from an “information deficit” rather than an “information overload.” We know far too little about the important things, and far too much about the unimportant. One of the notable gaps in our knowledge has been reliable statistics about R&D spending. The economy is driven by innovation, but we knew very little about who was doing the innovating and where. In particular, we had absolutely no idea how much R&D was being offshored by U.S.-based companies. In order to answer this question and many others, the National Science Foundation got funding a few years ago for a new survey on business R&D and innovation. I wrote about it in a September 2008 BusinessWeek cover story, Can America Invent Its Way Back? : “Innovation economics” shows how smart ideas can turn into jobs and growth—and keep the U.S. competitive. (This story is also the answer to a trivia question: What BusinessWeek cover was being delivered to the homes of subscribers when Lehman failed?). 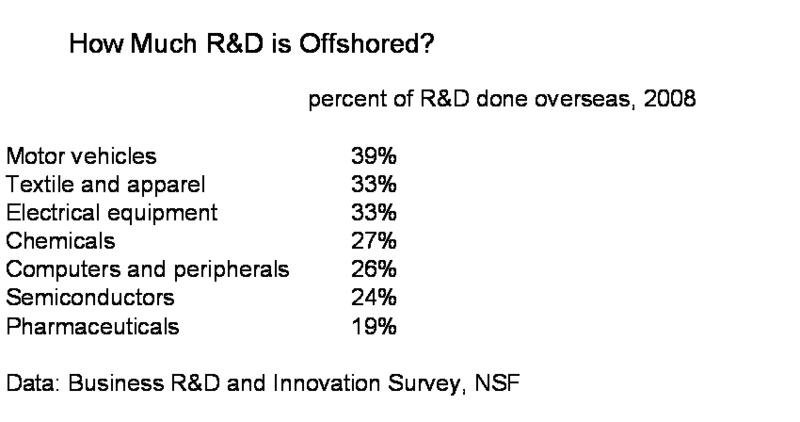 Now the NSF has released the initial results from the new Business R&D and Innovation Survey. For the first time, we have a good read on how much U.S. businesses are offshoring their R&D—setting up research facilities in other countries. It turns out that in 2008, manufacturers did about 20% of their R&D overseas. That’s actually a bit less than I would have expected. Here’s how it breaks down by some industries. Surprisingly, the industry which has done the most to offshore its R&D is the auto industry, with 39% of its spending done overseas. Other industries with a high rate of R&D offshoring include electrical equipment—that’s lighting, generators, and the like—and info tech hardware. Pharma had less offshoring than I would have expected. The survey was incredibly detailed, and there’s a lot more data releases coming in the future that will enable us to figure out the effectiveness of this spending for innovation, and the employment generated. It’s great stuff…take a look. Are domestic durable goods orders becoming less relevant? This Friday the Census Bureau will release the March report on durable goods new orders and shipments. Historically new orders for durable goods have been one of the best indicators of the economy’s future path. This survey collects statistics on domestic manufacturing activities of companies located in the United States. Activities of foreign affiliates or subsidiaries should be excluded. But with the increased offshoring of U.S. manufacturing, we’re seeing signs in some industries that U.S. spending can pick up, without any gains at all. Take computers, for example. 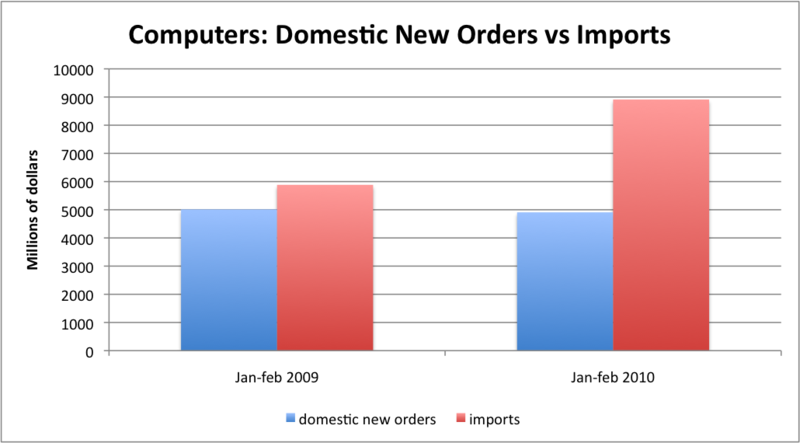 Over the past year, new orders for domestically-produced computers have fallen by 2%. Meanwhile, imports of computers have risen by about 50%. We’re seeing the same thing in the auto sector. 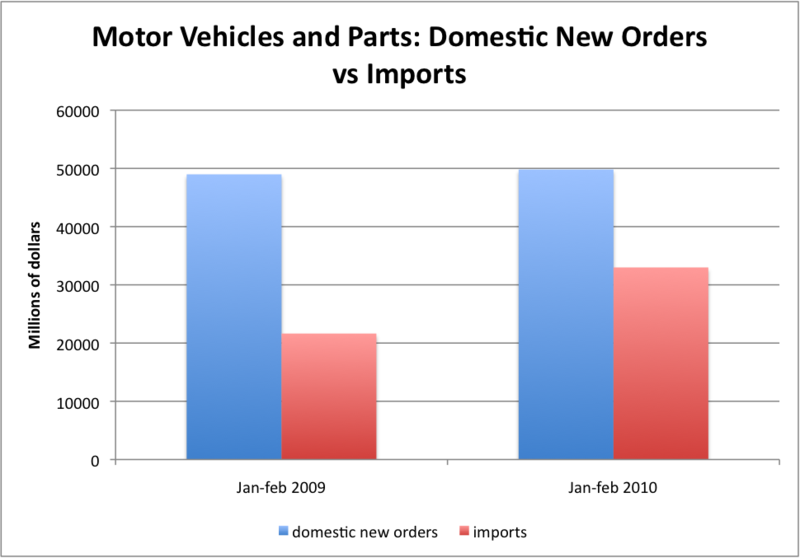 New orders for motor vehicles and parts from domestic manufacturers have risen by about 2% over the past year. But imports have soared by more than 50%. This is a sign of the continued hollowing out of the American manufacturing sector. Imports soar, while domestic production barely responds. I am going to be watching for a continuation of this trend on Friday.